We moved into our home in July of 2008, weeks before our daughter entered the world. It was immediately put to good use as my baby girl experienced all her milestones under this roof. I vividly remember her pulling herself to standing for the first time using the baby gate, potty training both kids, first words, many meals and fun birthday parties in this house. There have also been hard times in this house. This is where my husband recovered from appendicitis and the spot I received IV steroids after my multiple sclerosis diagnosis. I've spent hundreds of hours awake with both children and many hours alone while everyone peacefully rests. Despite over five years living in this house we call home, the fireplace remains unlit. When they were babies, it was obvious the dangerous area had to be baby proofed to not only prevent burns, but also pinched fingers and a mess. Now the kids are older and most importantly I am cold and I've decided we must have a fire. First, I hired the chimney sweeps which were much different than the ones in Mary Poppins. Also, they are not cheap. It cost me $200, but because we hadn't used it in five years and who knows what the prior owners did - my husband deemed it necessary and required before lighting a match. Next, I hit up Menards for a cheap tool set and some wood. With everything all set, I prepared a nice soup for dinner and talked up our after dinner fire imagining hot chocolate and fresh baked cookies as we snuggled nearby. In reality it was underwhelming. After dinner the kids were wild and my husband and I bickered over the proper placement of the logs. 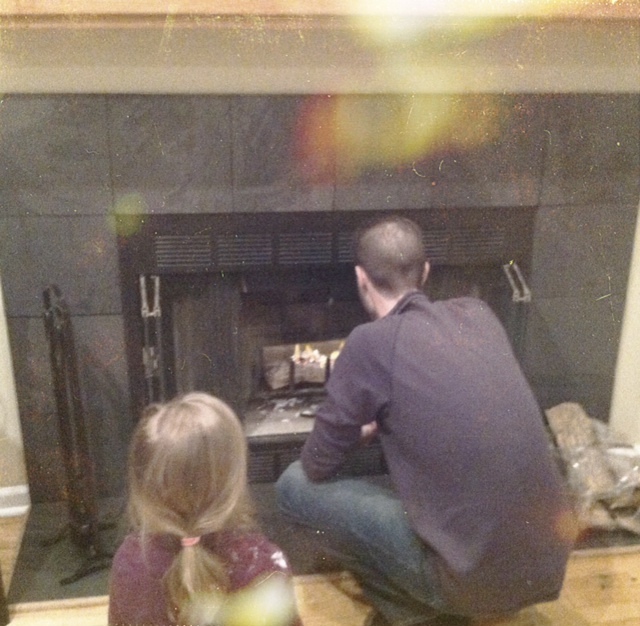 Then the dog started barking, the kids starting screaming, the house got a little smoky and the fire was still unlit. Introspective me analyzes this and wonders if our home is missing that spark needed to be a happy family like the ridiculously perfect pajama family. Or is this how real life works? Sometimes things are easy and fire quickly rages and other moments their is smoke and ashes and the fire will ebb and flow as long as it is continued to be cared for.